With 18 donkeys – in two stables – the donkeyparadise was fully inhabited already. But who could resist a donkey like Juliet? Not us. 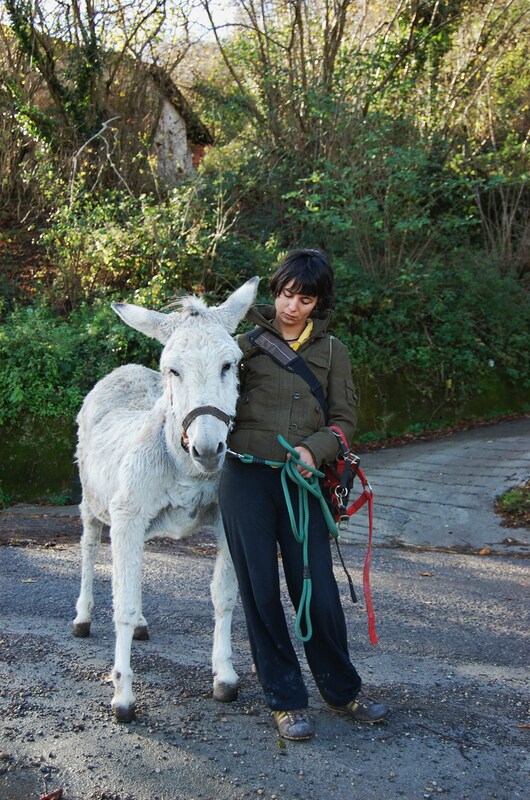 Estefania and Juliet on the way to the trailer of the donkey paradise. Nobody knows her age. Her body shows clear signs, though, of a long and extremely hard ‘working carreer’. With her frontlegs and breast torn apart, back caved in deeply, she has serious walking problems. Sarah and Todd from Australia recently spent several weeks here at El Paraiso del Burro – here is part two of Sarah’s story. Todd also worked in “Todd Valley” collecting rubbish from the river and raking brambles ready for burning and I started what will now be known as “Sarah’s Wall” *excitement* built from used tyres which a group of other volunteers had pulled from a hole on Marleens property – about 250 in all!!! 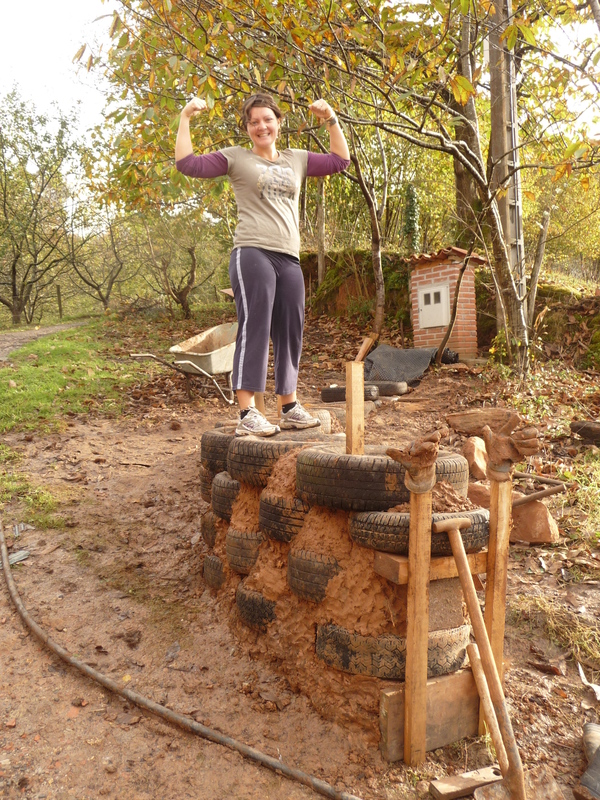 So we suggested possible uses of the tyres to Marleen, and she pondered over the ideas and we agreed on a wall – Which just quietly I’m glad because I didn’t realise how much work was involved and even though I would loved to have finished the project, my back is glad I’m handing it on!! 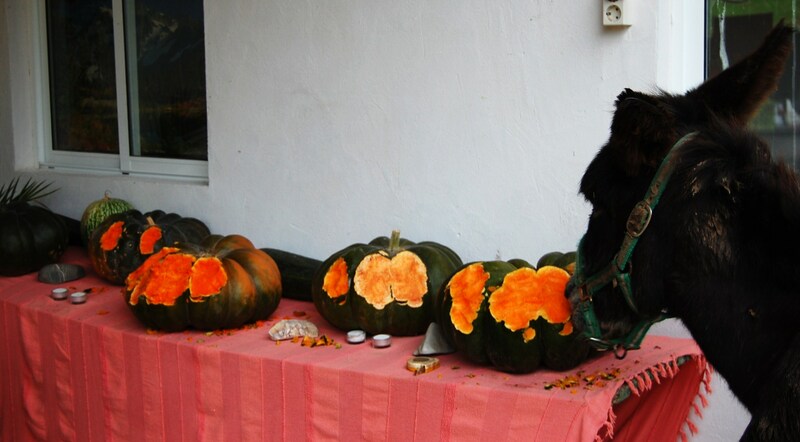 Marleen has many ideas for different projects around the farm and always invites input from others. Todd (with cap) and a couple of friends! We were also lucky enough to be involved in introducing a new member to the Paradise – I ALMOST got naming rights to her….ALMOST! But her name is Flora and she is very pretty….I think Kees and Marco may have some work cut out for them! Here the Donkeys are part of your everyday being – from stopping them getting into the storage room to eat that nights dinner, or searching for escapee’s Lola and Anes aka Thelma and Louise or every now and then slipping Nico an apple before the other Donkeys notice. 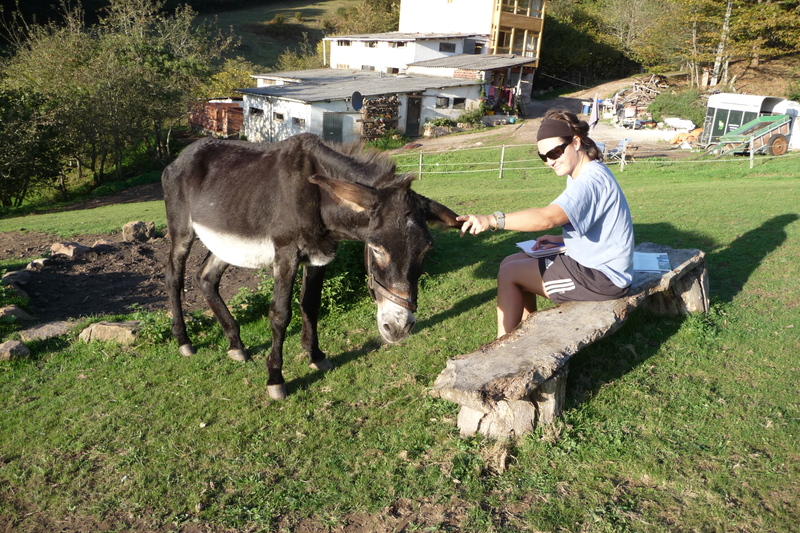 It is a great place to relax, feel welcomed, inadvertently learn about Donkeys and most of all help out where you can! I’m sure that we will be back to see Todd’s Valley and Sarah’s Wall completed, see the Donkeys and most anticipated – See Marleen super comfortable in her new home!!! Lay out dough approx 2inches high and cut with small glass – bake for 8-10 minutes at 190c. We wish you the very best Marleen – Thanks for a great experience!!!! Sarah and Todd from Australia recently spent several weeks here at El Paraiso del Burro – here is Sarah’s story of their stay: Part 1. 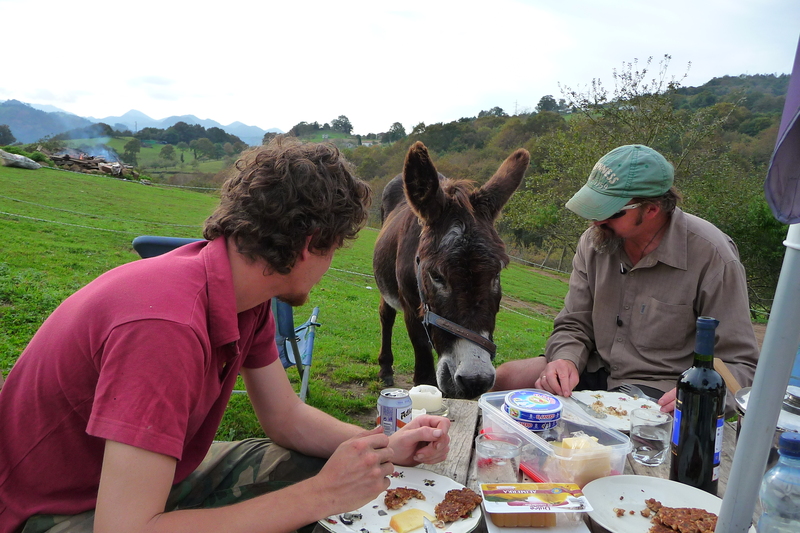 What a beautiful part of the world….And I don’t mean just for the donkeys!!! Are you a animal activist? An environmentalist? Because in reality you only need to be someone who knows someone who knows Marleen and you could help out a little around the Paradise. Time to relax in Paradise. She really isn’t fussed, Marleen is just doing what she can to help the world be a better place, and she‘s doing a bloody good job. Marleen makes you feel part of the family and a worthy volunteer of the inner workings of her home! When we arrived we were shown our caravan and just told to relax – A wine while watching the sunset helped us do just that! By the way – that isn’t just a one off either! And of course we can’t forget the Donkeys – so cutting up their dinner while having a wine isn’t too taxing and I guess that’s why we’re here J But Marleen wanting us to feel right at home said – “if you don’t feel like helping right now that’s ok” As far as we’re concerned it’s the perfect attitude that encourages you to help where you can! So for our first couple of days here we were collecting chestnuts because apparently Donkeys, like myself, don’t know when to stop eating something that is bad for them! We obviously weren’t quick enough and Marco was on the ground with his stomach sounding like an approaching thunderstorm – Marleen administered some drugs and Marco was up on his feet again searching for Chestnuts…..I’m sure of it!